Awesome Just Got Better Sea Jay Boats has announced an upgrade of the iconic Vision console / T Top combination. The new and improved console is a whole new design intened to give a better layout, improved options for mounting of electronics and to incorporate a better fold down T-Top system. At first glance the new Console is slightly larger than previous and shows stylish new grab rails on either side of the console. 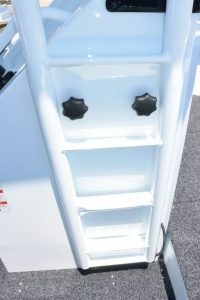 There is also a new dash area on top of the console for storing commonly used items, camera, wallet, phone etc To make the optional folding T Top lighter & easier to put up & down, the over head storage box has been removed, however the extra space in the redesigned console more than compensates for this. The folding mechanism has been revamped as well. Gone are the bolts with large internal wing nuts. These have been replaced by large easy grip bolts and captured nuts; a far easier way to go. The new console is being rolled out from mid 2018 on all size Vision models. The folding T-Top option is available on all sizes except the 460 Vision. October 2018 – Sea Jay Boats are pleased to announce the introduction of a new Runabout, the 428 Bay Seeker. 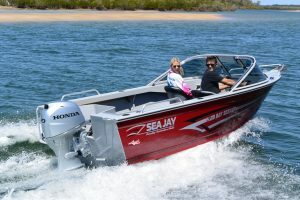 Built on the popular Adrenalin Hull the Bay Seeker is the perfect mix of performance and affordability. Newly released NOMAD HS – with 75mm high sides – a popular model for the Top End explorers. Standard Nomad still available in six hull lengths. View the specifications of the NOMAD HS model by clicking here. 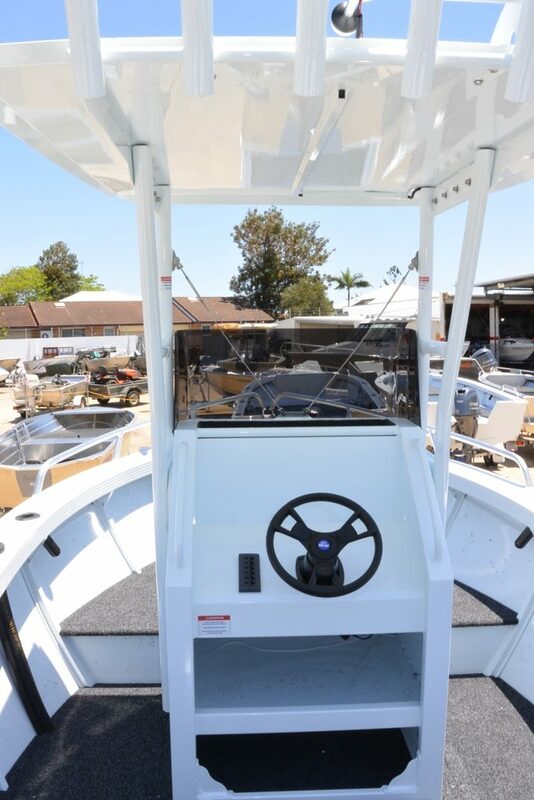 Introducing the 4.68 Navigator, another model that features the all new Adrenalin Hull, this model is a centre console configuration , a no fuss model, but with sufficient trimmings to please. The 4.68 is the first to be released in the Navigator range, with a 4.48 to be added in the future to complete this range. 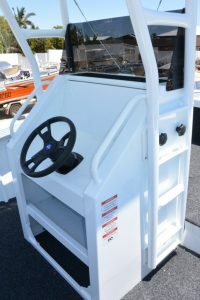 Designed for the fisherman, this model is standard unpainted, however paint is always an option, a seat / storage box is located behind the console for seating needs, and anchor well with front bollard is positioned in the foredeck, a front bulkhead, side pockets, wide side decks, short front rails and rear handles also feature, a rear step and rail is also fitted. A motor well is fitted with maximum horsepower rating for this model being a 70. The Name Adrenalin Hull has been chosen to promote the features of these hulls, as something that will give an “Adrenalin Rush” . Whilst speed is not synonymous with fishing boats, the most horsepower available often is, together with a good performing hull. Therefore these models have a much broader beam which in turn gives us more water displacement and hence enables the horsepower rating to be increased. As with all our Sea Jay Models we strive for excellent riding and good stability – this has certainly been achieved with the Adrenalin Hull with the performance of this hull giving the ultimate “Adrenalin Rush” Therefore we guarantee the new Navigator console model will sure to give the ultimate performance for the avid fisherman.